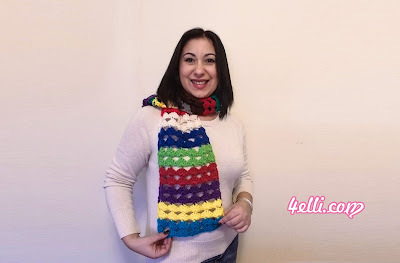 How to crochet my ugly scarf!!! Row 1: 1sc into the 2nd chain from hook, *skip 2, 5dc into the next, skip 2, 1sc into the next* repeat from * to* across. Row 2: chain 5, turn, *1sc into the center dc of next shell, chain 5* repeat from * to * across, to finish the row: chain 2, 1dc into the last stitch. Row 3: chain 1, turn, 1sc into the 1st stitch, *5dc into th next sc, 1sc into the next chain space* repeat from* to * across. repeat rows 2 and 3 until you have the length you want. please watch my free video tutorial witch shows you how to crochet my ugly scarf! !